A high-performance lubricant is available that out performs the competitors. SWEPCO 801 not only penetrates and loosens nuts, bolts, screws, equipment and other corroded items, it also lubricates and protects these items. Unlike other competitor penetrating fluids, SWEPCO 801 leaves a coat of oil, corrosion inhibitors, and anti-wear agents. 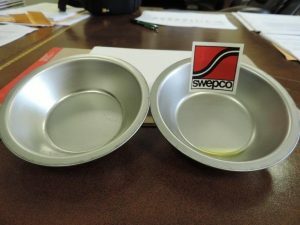 We sprayed an equal amount of SWEPCO 801 and a major competitor into a couple of pans. After a couple of days, the competitor product was gone, but the 801 was still leaving a protective oil coating. SWEPCO 801 Clear Penetrating Lubricant comes in a convenient spray-any-way aerosol can with a pleasant aroma. SWEPCO 801 penetrates quickly and help’s to eliminate the need to heat, cut or use excessive force to loosen and remove corroded nuts, bolts and equipment. It eliminates squeaks in door hinges, overhead doors, and adjustable tables. After disassembly and prior to reassembly, spray parts with SWEPCO 801 for ease of assembly and prevention of further rust and corrosion. The clear formulation makes for easy clean up and less mess. We have found several uses around the house for SWEPCO 801, for example eliminated the squeak of doors and several other applications. 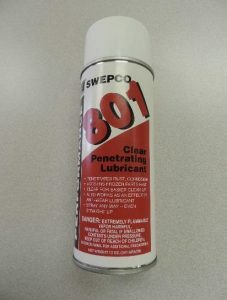 SWEPCO 801 Clear Penetrating Lubricant should be in your tool box, it is in ours!